Here’s a slot that throws shade to our frigid British winters — Mammoth Money. Are you freezing your toes off, even when the sun is shining? Is there snow in your backyard in the middle of April? Funny we haven’t had wooly mammoths roaming our grounds yet. Well, the weather may be cold and dreary, but we must soldier on! In fact, we will warm our hands and spirits in our own way. We’ll win in the face of cold temperatures! This new slot by mFortune Casino helps us do just that. Mammoth Money is an icy-blue slot with the potential to pay out serious cash. There’s a fun bonus game that is packed with multipliers and reels that deliver extra spins galore. What more, Mammoth Money rides on mFortune’s fabulous reputation for creating little jackpot winners all year round! Mammoth Money is a welcome addition to mFortune’s slot portfolio and another game to add to your repertoire. Mammoth Money is actually a rather simple slot. There are nine win-lines in the game. You can choose how many you’d like to play with during the game, by toggling the ‘+’ or ‘-’ symbols at the bottom of the screen. Bets start from as little as 2p per spin, although you can jack this up to whatever denomination you prefer. For example, if you want to play all nine winlines at 5p each, each spin will cost £0.45. Your chances of winning are the same whether you play on a tight budget or like a high-roller. The only thing that changes is the pace of your gameplay — the more winlines, the faster the game. There are eight different symbols on the reels. First, there’s the usual low-value bunch of symbols, namely 9, 10, J, Q, K and A. On top of these, there are a bunch of (now extinct) animals from the Ice Age such as the ground sloth and wooly mammoths. The sabre-toothed tiger is the game’s Wild symbol that stands in place for other base game symbols and completes winlines. Our furry friend, the Wooly Mammoth reveals the game’s massive jackpot. It’s hard to miss this guy; he’s got the phrase “JACKPOT” emblazoned across its tusks. Now, Mammoth Money is a progressive jackpot slot, which means that a portion of every single wager made in the game is set aside as prize money. The more the game is played, the more money is pooled for the jackpot. mFortune’s jackpot slots usually climb to the mid-thousands before someone pockets the slot. It’s a refreshing change from five- or six-figure jackpots that are almost impossible to win. Mammoth Money is a simple slot, especially for mFortune’s high standards of game production. The mFortune team has decided to forgo designing complicated scenes this time. (I’d recommend Hansel and Gretel to experience the full creative powers of the mFortune gaming studio). Anyway, the icy blue backdrop and simple artwork in Mammoth Money won’t blow you off your feet. At the same time, it’s nothing to complain about either. You may even be tickled by the cheeky little details, such as the ice cracking during the bonus feature. There’s a nifty autospin feature built into the game too, so you could play while waiting for the bus without turning your fingers into icicles. You can choose how many spins to run the Autospin feature for and decide when to stop (e.g. when you hit a certain win amount or when your credit falls/rises to a certain amount). As with all mFortune slot games, you’ll need to download the app from their website or from the App Store to play. The app allows you to deposit in-game using debit/credit cards or via your phone bill. This depositing feature is perhaps my favourite feature of all. No fumbling about with e-wallet accounts or 16-digit credit card numbers. All you have to do is confirm the transaction via SMS and you’re good to go! Mammoth Money’s mini game looks like a scene out of the movie, Ice Age. Titled “The Acorn Hunt”, you’ll move Manny, the chipmunk around the icy game board to collect multipliers and hunt down his beloved acorn. The game is triggered whenever you get three golden acorn symbols on the reels. To begin, you’ll roll the die (or tap on the ‘Roll’ button in the bottom-right corner of the screen, to be specific). This dictates how many steps your chipmunk should move. Every time he stops, he’ll pick up the multiplier on the ground and add it to your stash of riches. You can keep rolling for as long as you get multipliers. Meanwhile, the game ends when you land on a skull. The ultimate goal is to find the golden acorn. This sends your chipmunk into his special euphoria. Of course, it’ll properly boosts your casino wallet too as the Golden Acorn is worth a whopping 50x multiplier. I haven’t enjoyed the great fortunes of stopping on the Golden Acorn, but I have been treated to long runs of this mini game. It’s a real wallet-booster, especially after you land on many little multipliers in a row. Aside from this acorn hunt, you can also pocket a nice helping of extra spins in Mammoth Money. All you need is at least three extra spin symbols anywhere on the reels. This is the lime-green button with the words ‘Extra Spins’ on the front. Once you collect three extra spin symbols, the game automatically starts five extra spins on the boards. However, if you get four or five extra spin symbols, you’ll get seven or nine extra spins respectively. You can’t expect a gold rush from these extra spins, but every extra winning combo is always welcome! 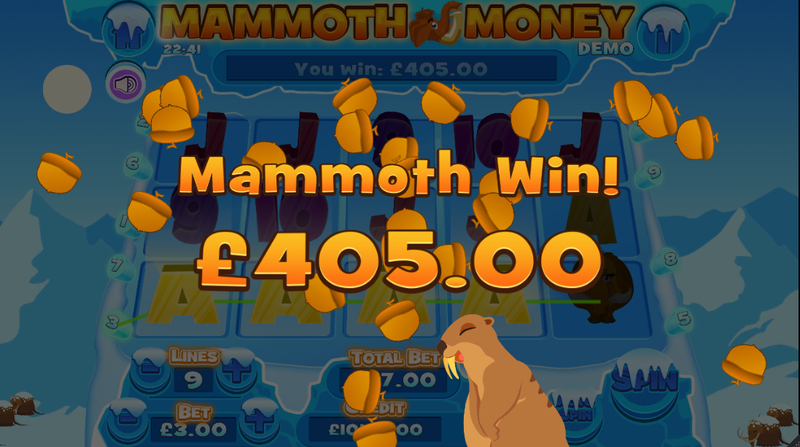 Mammoth Money At mFortune — Free £5! As usual, new players get £5 free to try out Mammoth Money. If you’ve played at mFortune before, you’ll get £3 free instead. Mind you, there’s no deposit required! The casino also doubles all first deposits, so that you have twice the amount of money to play with. All of mFortune’s games are designed exclusively for the site, so you can’t find them anywhere else. Want to play Mammoth Money? Mammoth Money mobile slot is another stunning production from mFortune Casino. Start playing with a £5 free bonus! Mammoth Money Mammoth Money doesn’t break any new ground in terms of slot features or production value, but it’s a very pleasant game indeed. The game is perfect for a casual spin, as it’s guaranteed to add a little cheer to your day. Since the game accepts spins from as low as a penny and encourages small deposits, you’ll find yourself turning to the app every time you have five minutes to yourself! I’d recommend downloading a few mFortune titles onto your phone at a time, so that you have a nice little selection of entertainment at your fingertips. Bake Me A Winner is a fun one, and so is Sherlock: Murdered to Death. I might sound like a broken record, but mFortune games wins yet again! NextWhen Is It Appropriate for Slots Developers To Use Cultural Symbols?